You can book a ticket worth Rs 500 in just Rs 210 only. 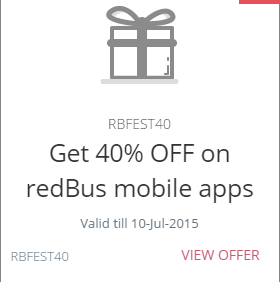 How to book bus tickets at flat 50% off ? 2. Now open the app and login/sign up. >> Pilani Soft Labs Pvt. Ltd. reserves the right to end any or all offers at its discretion without any prior notice. >> All disputes are subject to Bangalore jurisdiction.